193 Beacon is located on the south side of Beacon, between Berkeley and Clarendon, with 191 Beacon to the east and 195 Beacon to the west. 193 Beacon was designed by Peabody and Stearns, architects, and built in 1871, one of three contiguous houses (191-193-195 Beacon), with 193 Beacon and 195 Beacon forming a symmetrical pair. 191 Beacon and 193 Beacon were built for James Henry Blake, and 195 Beacon was built for Nathaniel W. Curtis. The land for 191-193 Beacon was purchased by James H. Blake from William Carpenter in two transactions, 193 Beacon on December 21, 1870, and 191 Beacon on March 23, 1871. The land for 195 Beacon was purchased by Nathaniel Curtis on December 16, 1870, from Francis E. Parker, a lawyer, who had purchased it from William Carpenter on April 11, 1870. William Carpenter was a builder and it is possible that he constructed all three houses. The land had previously had several owners and originally was part of two larger parcels acquired from the Commonwealth of Massachusetts on March 7, 1860, and May 2, 1860, by Norman Munson. Norman Munson and his partner, George Goss, were the contractors responsible for filling the Commonwealth’s Back Bay lands. Click here for an index to the deeds for 193 Beacon. In his Houses of Boston’s Back Bay, Bainbridge Bunting indicates that 191-193-195 Beacon were built in 1872. Based on the wording of the party wall agreements, however, it appears that the houses were begun and probably completed in 1871 (both the agreement on December 16, 1870, between the owners of the lot at 195 Beacon and of the house at 197 Beacon and the agreement on April 24, 1871, between the owners of the lot at 191 Beacon and of the house at 189 Beacon, indicate that construction is about to begin). James Henry Blake and his wife, Alice (Spring) Blake, made 193 Beacon their home. He was a banker. They previously had lived at 62 Mt. Vernon. James Blake died in November of 1889, a suicide. Alice Blake continued to live at 193 Beacon with their son, Henry Spring Blake. On February 6, 1890, 193 Beacon was acquired from Alice Blake by Thomas Niles, Jr. Alice Blake and Henry Spring Blake moved soon thereafter to 49 Massachusetts Avenue, which Thomas Niles, Jr., purchased in March of 1890. It appears likely that his purchase of 49 Massachusetts Avenue and subsequent lease of it to Alice Blake was part of the consideration for 193 Beacon. Thomas Niles, Jr., was a publisher with Roberts Brothers, and is credited with suggesting to Louisa May Alcott that she write a “write a girls’ book” for his firm, the resulting work being Little Women. A bachelor, he lived at 110 Beacon with his cousins, Emily Hale Niles, Anna Hale Niles, and Sarah Fowle Niles, the daughters of his uncle, William Jenkins Niles and his wife, Mary Ann (Hale) Niles. By the 1890-1891 winter season, 193 Beacon was the home of George Henry Cotton and his wife, Cora N. (Doane) Stimpson Cotton. They previously had lived at 16 Chestnut. They also maintained a home in Belmont. Living with them were George Cotton’s sons by his first marriage (to Josephine Buckingham, who died in February of 1881), Joseph and Henry Cotton, and also Cora Cotton’s son and daughter by her first marriage (to Oliver D. Stimpson, who died in December of 1881), Edward and Charlotte Stimpson. George Cotton was a manufacturer of brass tubing and also the founder of the Belmont Springs Water Company. Thomas Niles, Jr., died in May of 1894 while traveling in Europe. The Cottons continued to lease 193 Beacon from his estate until the the 1898-1899 season, after which they moved to 403 Marlborough. 193 Beacon was not listed in the 1900-1903 Blue Books. On February 26, 1903, 193 Beacon was acquired from Thomas Niles’s estate by Arthur Patterson Chadbourne, a physician and ornithologist. His mother, Isabel Antoinette Bates (Patterson) Chadbourne, the widow of dry goods merchant William Chadbourne, lived with him. In 1903, they had lived at 225 Marlborough. Arthur Chadbourne married in November of 1905 to Ethel Richardson. After their marriage, they lived at 193 Beacon with his mother. On December 12, 1905, Arthur Chadbourne transferred 193 Beacon to his mother. Ethel (Richardson) Chadbourne died in October of 1908, and he married again in October of 1909 to Eva Wilson. 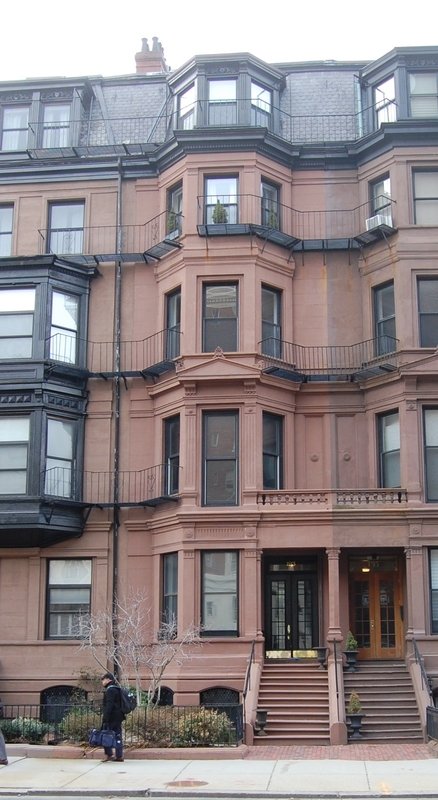 Arthur and Eva Chadbourne lived at 193 Beacon with his mother. Isabel Chadbourne died in May of 1912, and Arthur and Eva Chadbourne moved soon thereafter to the Hotel Victoria at 273 Dartmouth. 193 Beacon was not listed in the 1914 and 1915 Blue Books. During the 1915-1916 winter season, 193 Beacon was the home of mining company executive Richard Fay Parker and his wife, Emma Rosalie (Guild) Parker. 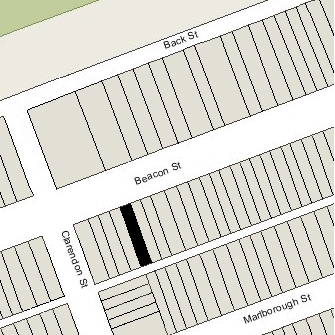 They previously had lived at 120 Marlborough and by the 1916-1917 season they had moved to 385 Marlborough. On July 24, 1916, 193 Beacon was acquired from Arthur Chadbourne by the estate of John Gorham Nichols, who had died in December of 1913. It became the home of his daughter and son-in-law, Clarence Vose Burrage and Alice (Nichols) Burrage. They previously had lived in Walpole. Clarence Burrage was treasurer of a rug and carpet company. 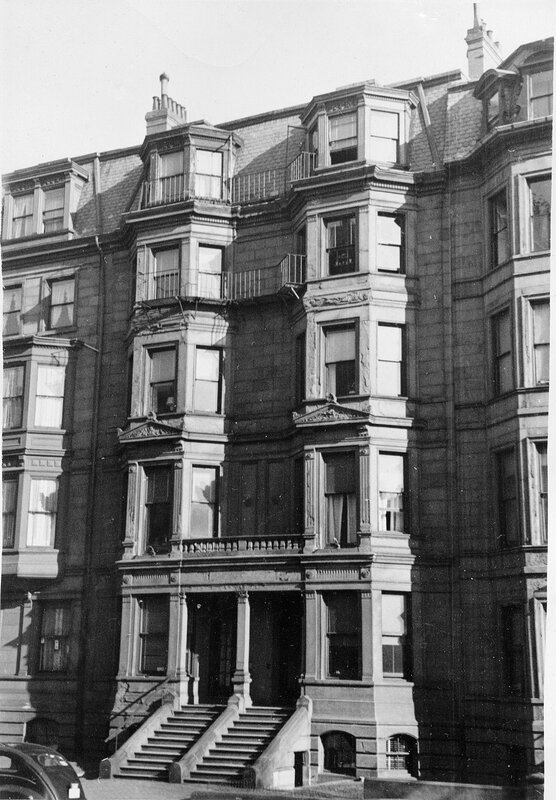 The Burrages continued to live at 193 Beacon during the 1917-1918 winter season, but moved thereafter and by the 1919-1920 season were living at 319 Dartmouth. 193 Beacon was not listed in the 1919 Blue Book. It continued to be owned by the estate of John G. Nichols. By the 1919-1920 winter season, 193 Beacon was the home of Mrs. Constance Baillie (Rose) Ripley, the former wife of stockbroker Louis Arthur Ripley, from whom she had been divorced in about 1916. Their four children — Julie, Constance, Louis, and Sidney Dillon Ripley — lived with her. They also maintained a home in Litchfield, Connecticut. S. Dillon Ripley later would become a noted ornithologist and would serve as Secretary of the Smithsonian Institution for twenty years. They continued to live at 193 Beacon during the 1920-1921 season, but moved thereafter to 163 Beacon. By the 1921-1922 winter season, 193 Beacon was the home of Samuel Hammond and his wife, Grace (Learoyd) Hammond. They previously had lived at 194 Beacon. They also maintained a home, Castlerock, in Nahant. Samuel Hammond formerly had been associated with Glidden & Curtis, agents for the Pacific Guano Company, and had then served as deputy City Tax Collector. He retired in 1900. On November 28, 1923, Samuel Hammond purchased 193 Beacon from the estate of John G. Nichols. On December 5, 1923, he transferred the property to his wife. Samuel Hammond died in April of 1934. Grace Hammond continued to live at 193 Beacon during the 1934-1935 winter season, but moved thereafter to 8 West End Place. The house was not listed in the 1936 and 1937 Blue Books and was shown as vacant in the 1936-1938 City Directories. On August 16, 1937, 193 Beacon was purchased from Grace Hammond by real estate dealer Ray C. Johnson. In November of 1937, H. Leon Sharmat applied for (and subsequently received) permission to convert the house from a single-family dwelling into a lodging house. He was a commercial banker and treasurer of the real estate firm of Warren-Stevens, Inc. which acquired the property from Ray C. Johnson on February 20, 1939. On September 6, 1940, 193 Beacon was acquired from Warren-Stevens, Inc., by Benedict Gerard Groder, who made it his home and operated it as a lodging house. He previously lived at 39 Chestnut. In about 1946, he acquired 358 Marlborough, which he operated as a lodging house, managed by Gerald J. Bovee, who previously had been a lodger at 193 Beacon. By 1948, B. Gerard Groder also had acquired 345 Beacon, which he operated as a lodging house. By the early 1950s, he had moved there but continued to also own 193 Beacon and operate it as a lodging house. He continued to live at 345 Beacon in the mid-1960s, but moved back to 193 Beacon by 1970. He lived there and operated it as a lodging house until the late 1970s. On October 2, 1979, 193 Beacon was purchased from B. Gerard Groder by Jeffrey M. Rome and K. Cory Benson. That same month, they applied for (and subsequently received) permission to remodel the house and convert it from a lodging house into four apartments. In January of 1980, they applied for (and subsequently received) permission to construct a two-car garage at the rear of the property. 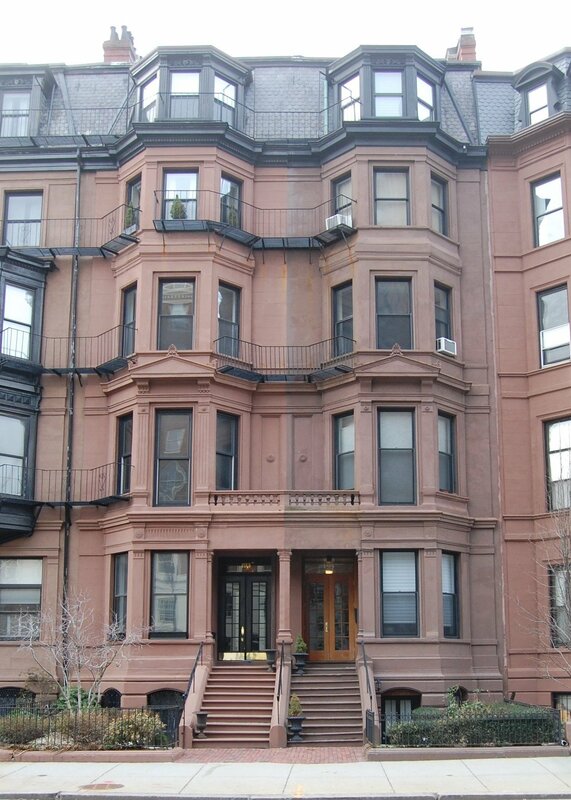 On October 3, 1980, Jeffrey Rome and K. Cory Benson converted the property into four condominium units, the 193 Beacon Street Condominium.